Murray Waas has a post (pasted whole below) saying Bushco is seriously discussing the closure of Gitmo. Yawn. Stretch. Why is this blog so much about Guantanamo and little else today? 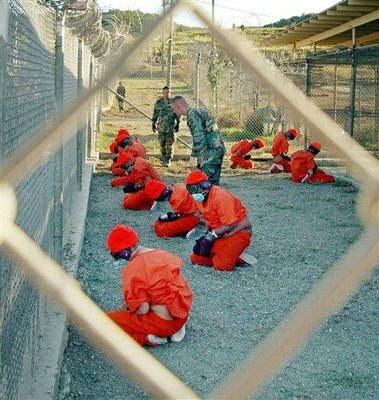 The Bush administration is for the first time debating the very real possibility that Guantanamo be shut down entirely. It is the first prolonged and serious debate and review of the issue, according to people who are in the know. That debate and the road to whatever final decision is made by the President (and the decision will be his) is probably not only going to be an important news story, but almost certaintly also decision making process that will be examined again and again by future historians of the Bush presidency. More... as I know more, if I am able to find out much. The thing is, this would change absolutely nothing except the geographic location of detainees. Gitmo is an albatross to the Repugs and they can make a big show of closing it as if the torture were confined to that prison only. More smoke and mirrors folks. Its all for your amusement. Are We Near The Entrance To The Rabbit Hole?